Aesthetics and elegance meet in superlatives in this luxurious 55sqm suite, which are complemented with an impressive 45sqm roof garden with hydromassage and panoramic view of the Old Town. 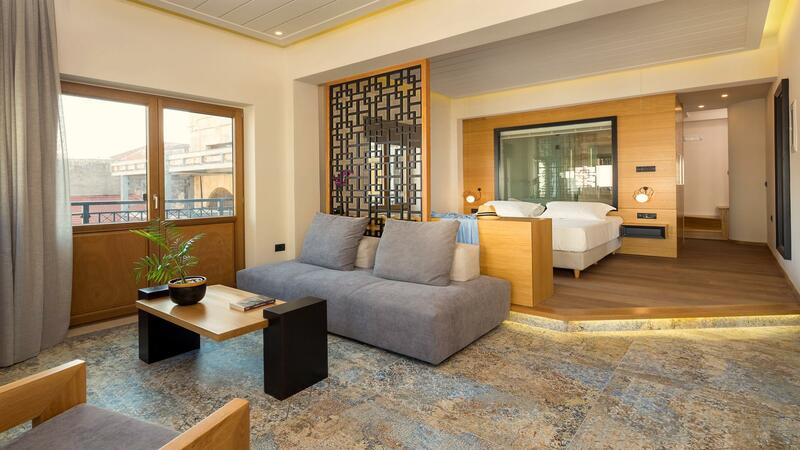 Querini Superior Suite constitutes the ideal choice for quality and unforgettable holidays. Breakfast is optional and costs 10 euros per person per day. Once you have settled in, we will be on hand to share with you information about shops, restaurants, museums, beaches, local feasts, or anything else you may need. On arrival you will find a complimentary basic pack with fruits, coffee tablets (provided by the maid daily) , milk for coffee, sugar, tea, mineral water, orange juice, beers, and coca cola. Querini Deluxe Suite is Non-Smoking . The spacious outdoor areas though it is sure to completely meet your needs. The suite will be cleaned by our maid every day. Towels are provided by the maid daily and fresh bed sheets every second day. Our philosophy as well as our overall effort is to make the visitor’s stay as idyllic and attractive as possible. In order to achieve that we provide, upon request, a range of additional services with separate charge for each one of them. For more information and anything else you need we are at your disposal. The hotel was immaculate! It was right in the heart of the old shopping district, not far from the wharf. Manolis, our hotel contact, gave us exceptional recommendations for sightseeing and restaurants in western Crete. The hotel room was clean and modern and looks to have been newly renovated. There were shops and bars and wonderful restaurants all within walking distance from us. We had a great stay. The suites are amazing and could not be more centrally located! Easy access to the port of Chania, shops on main street, bars and restaurants. The room is even better than the photos and completely sound proof. Manolis is the coolest host and has so many proposals for whoever visits Chania that ensure all main aspects are covered (key beaches, restaurants etc) 2 public parking stations are on each side of the suites – very short walking distance Have fun! I have nothing to fault about this place. The apartment is very spacious and designed to a high spec. The host was very welcoming and thoughtful. The location is very central but quiet in the evening so could sleep peacefully. My favorite part was definitely the roof terrace with the sun loungers and the spa bath.